they're sure to use. Your gift may get more attention at the baby shower than the mom-to-be! �- perfectly practical, and adorably unique. 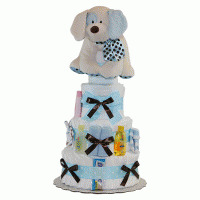 When someone special welcomes a new member of the family you want to give an�absolutely practical�and�supremely unique�baby shower gift�to express your congratulations. Flowers are pretty but they only last a little while and then they end up in the trash! A gift basket is practical, but so...ordinary. The big question is, "What do the parents of a new baby need more than anything else?" Unless you can give the gift of SLEEP, the answer is�DIAPERS!! 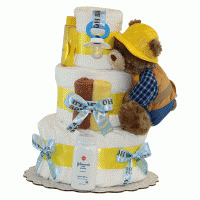 Instead of throwing money away on fresh flowers, why not give a new baby gift that is just as beautiful, FAR more practical, and CERTAIN to be used - a diaper cake! �is designed to be easily dismantled so that sleep-deprived mom and dad can quickly convert it into a mountain of much-needed diapers and supplies. �or delivered personally, rest assured that our professionally created and carefully shipped new baby gifts have proven themselves time and time again to be only the best. �that make the "how to" into the "well done." 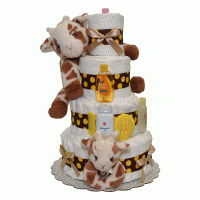 With our undecorated diaper cakes, you can give a professional quality new baby gift, in a tiny fraction of the time it takes to make a diaper cake from scratch. We love win-wins. Planning a baby shower for a special mom-to-be? Browse through our�free baby shower ideas�page for tons of baby shower decoration ideas, baby shower theme ideas, free baby shower games, and more. We want your baby shower to be an event to remember...thanks for letting us be a part of your celebration! 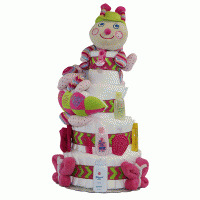 We are located just outside of�New York, NY�and have shipped thousands of diaper cakes all over the United States through the years. 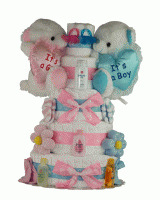 We take pride in each one and invite you to browse our large selection of beautiful new baby gifts.